Editor's Note: If you're new to this series, make sure to go back and check out History of the Drum Set Part I: The Evolution of the Tom and Part II: Snare Drums Through the Years. 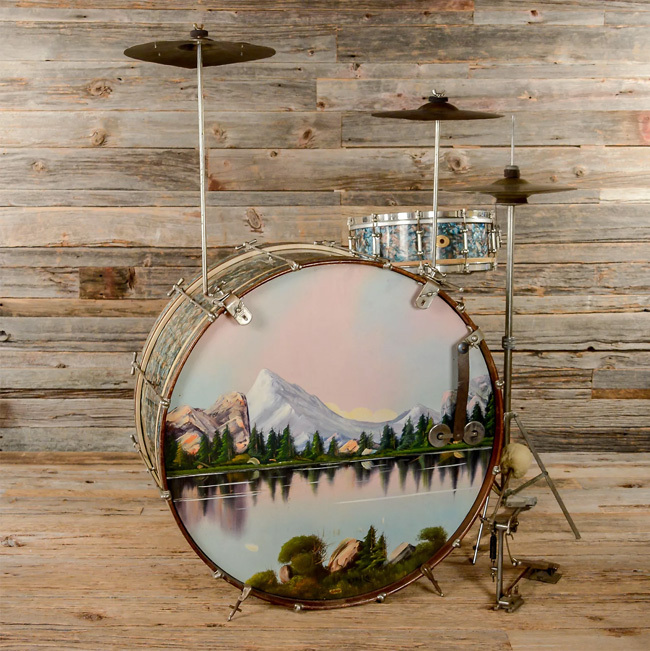 From the gargantuan wallop of rock gods like Bonzo and Cozy Powell to the machine gun assault of metal drummers like Chris Adler and Thomas Haake, the bass drum has cemented itself firmly into the legacy of western music. Indeed, as one of the first few components to coalesce into the drum kit proper in the early 20th century, the bass drum’s importance cannot be overstated. Its evolution from thunderous concert hall mainstay, to jazzy melodic tone, and back to a stadium–filling thud has been in lockstep with popular music and recording tech trends throughout the 20th century. This week, we’re going to take a look at a few snapshots on the bass drum’s long and storied history. In truth, the bass drum as a kit component can’t really be discussed without first addressing the advent of the modern bass drum pedal. Without it, we may never have developed the quintessential sideways floor–standing kick drum — perhaps the most instantly recognizable feature of the modern kit. While early 1900s Vaudeville and concert hall musicians were “doubling up” by playing both snare and bass drum parts with sticks, a pair of young Chicago drummers called William and Theo Ludwig began developing a pedal contraption that would allow drummers to use both hands to play snare parts without sacrificing the ability to play the bass drum. Though the Ludwigs’ bass drum pedal was not the first of its kind (inventive drummers had been experimenting with crude homemade wooden contraptions for some years), it was far and away the best by design — all–metal construction, lightweight and collapsible, with adjustable spring tension. Starting with this contraption, the Ludwig family name would become ubiquitous in the world of drums. The big 28–inch and 30–inch bass drums common in the orchestra pits of the day were cumbersome enough to play already, so the pedal was an almost overnight success with working drummers due to its superior response. 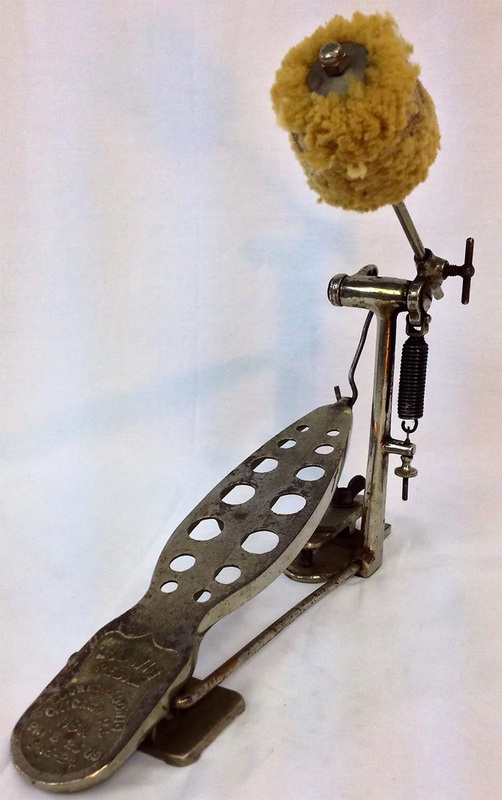 Other companies quickly followed suit, and soon, small metal bass drum pedals with large lambswool beaters could be had from the likes of Leedy, Slingerland, and others. This arms — or, rather, feet — race would spark a trend in bass drum pedal innovation that continues to this day. By the late 1920s, two and three–piece drum kits were becoming commonplace, especially in the burgeoning big band scene. The bass drum was the centerpiece of the kit, both visually and structurally, and was adorned with everything from woodblocks, traps tables, and cymbal arms to internal lights and elaborately painted scenes on the resonant head. However, the primitive recording technology of the day wasn’t really up to the task of capturing the low–end attack of such large drums, which were still usually around 26 to 28 inches in diameter. This meant that the bass drum remained largely absent from the recordings of the day, deferring to snare drums, woodblocks, and cymbals to carry the beat. But by the ‘30s and ‘40s, as microphones became better suited to low frequency capture, the bass drum finally made its way onto the airwaves. Anchoring many upbeat swing–era hits with a four–on–the–floor pulse, the boisterous drum was now a dance band essential, often sporting the name of the drummer or group on the calfskin reso head for maximum publicity at live events (or on the new–fangled gadget called “television”). Additionally, as the modern tom evolved and cymbal selection widened, drum companies began outfitting their high–end kits with “consoles” — massive tubular steel contraptions mounted on top of the bass drum designed to hold the drummer’s growing arsenal of ancillary percussion instruments. Following World War II, the bass drum — like the rest of the kit — began to standardize along genre lines and became more like the drum we know today. Big band players like Buddy Rich still favored larger 14– by 24–inch and 14– by 26–inch drums for their ability to hold high tunings and keep a deep pitch, while rock ‘n’ roll and blues players favored the smaller 14– by 22–inch for their attack and punch (not to mention portability). Meanwhile, as bebop was taking its first steps, drummers like Max Roach, Kenny Clarke, and Elvin Jones gravitated towards smaller drums, tuned higher to form a more cohesive melodic unit with the toms. At first, the 14– by 20–inch was the go–to option. Later on, even smaller 14– by 18–inch and 12– by 18–inch drums would become the norm. Hardware had changed, as well. Gone were the massive consoles of the swing era, replaced with downsized “consolette” rails and shell–mounted cymbal arm brackets. This diversification can be seen in the explosion of different outfits offered by manufacturers as the ‘50s gave way to the ‘60s. 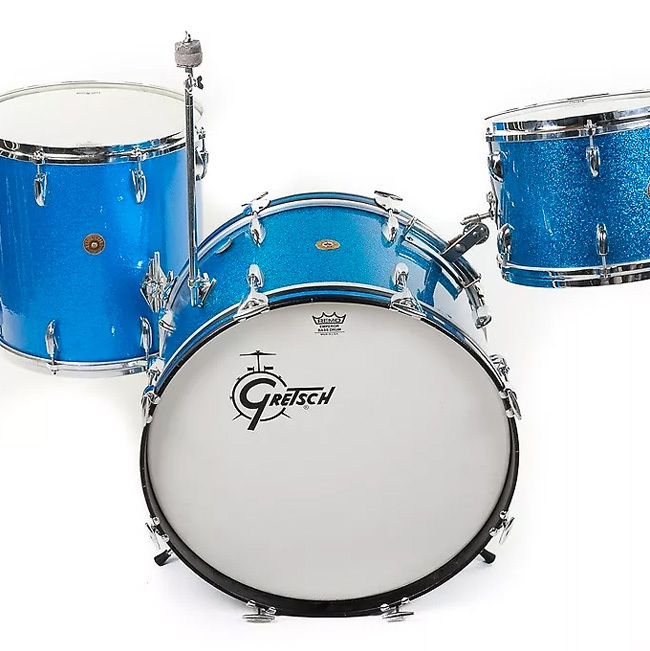 Kits with larger–diameter bass drums, like Slingerland’s Gene Krupa Deluxe and the Gretsch Broadkaster “Name Band,” could be seen alongside the Rogers Orbit and Ludwig Jazzette, which featured 20–inch and 18–inch bass drums, respectively. In addition, the early double bass antics of showier, big band drummers like Louie Bellson meant it was also possible to order massive dual–kick, tri/quad–tom kits (see: the Ludwig Blue Note and Slingerland Duet outfits), though the price kept these out of the hands of many working pros and hobbyists. As the ‘60s came to a close and studio tech evolved once again, the bass drum fell victim to the same deadened, close–mic’d approach used on tom toms. Drummers like Ringo Starr of the Beatles and John Densmore of the Doors began removing the resonant head to achieve a more attack–heavy sound. Pillows, blankets, and felt strips were also added inside of the drum, exaggerating the effect. The result was a far cry from the bass drum’s echoing, thunderous origins, but translated to the recorded media of the day perfectly. The defined low–end attack sailed under the bass guitar and lower–register vocals beautifully. 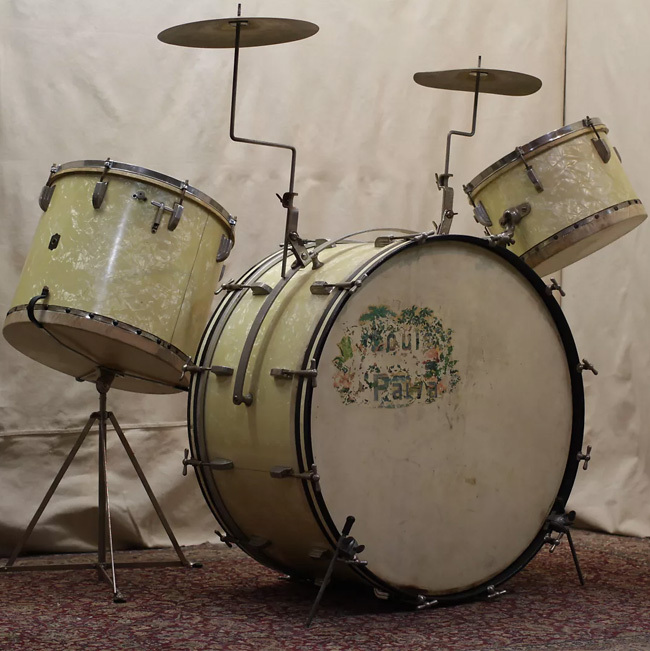 Manufacturers did eventually offer true single–headed bass drums on some outfits, like Slingerland’s Pop Outfit No. 58N and the Ludwig Standard Single Six, but these did not prove overwhelmingly popular. 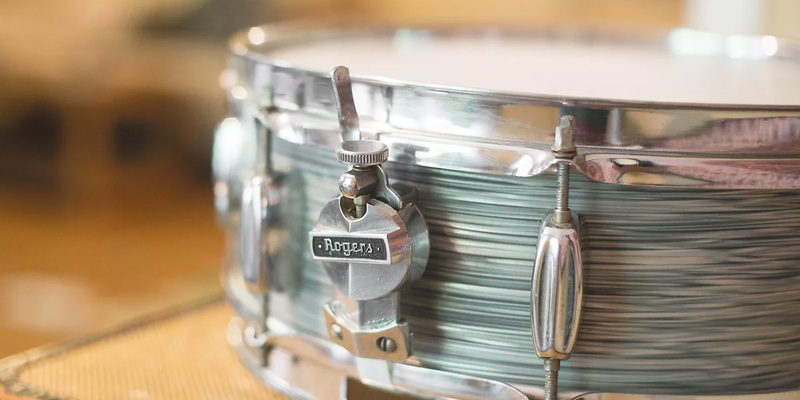 Rather than ditching the front head altogether, many players ended up simply cutting holes in their resonant heads to achieve the same effect, which meant no risk of losing or misplacing reso hoops and hardware or damaging the exposed drum shell. Building on the prior successes of bands like Cream, Vanilla Fudge, and Deep Purple, hard–hitting arena rock climbed towards its zenith in the 1970s with a new crop of heavy–hitters. As these drummers began looking for ways to compete with massive guitar rigs, the size of the bass drum began to grow once again. Aside from drummers like Neil Peart and Nick Mason embracing the multi–tom, double–bass setup, players like Carmine Appice, John Bonham, and Simon Kirke were all using big 26–inch bass drums that wouldn’t have seemed out of place on the big band stage a couple decades prior. These larger drums made a bold sonic and visual statement that could be heard on the recordings of the day. Most notably, Led Zeppelin’s “When The Levee Breaks” featured Bonham’s 14– by 26–inch Ludwig echoing through the stair hall of Headley Grange mansion (along with a fair amount of compression). Once again, drum makers looked to capitalize on this trend by expanding their product lineups. 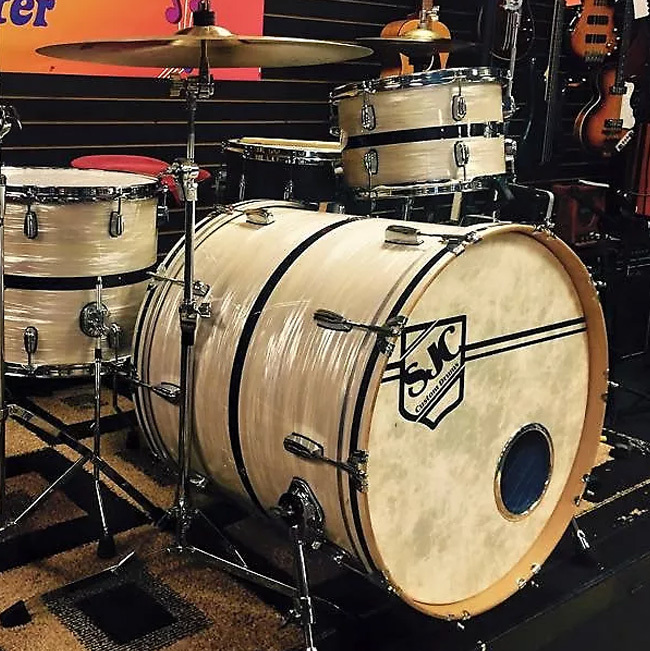 Soon, kits like the Ludwig Pro Beat, Gretsch Broadkaster II, and Slingerland Classic Rock (which all featured 24”–inch bass drums and multiple rack toms) could be seen alongside more traditional offerings. 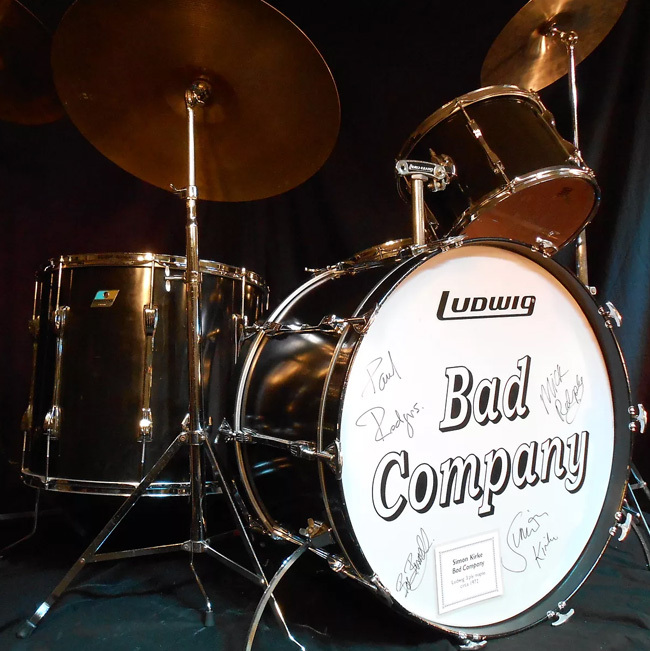 By the end of the ‘70s, this trend had reached a fever pitch, with setups like the Ludwig Power Rock Outfit, which, in its ultimate guise, featured twin 14– by 26–inch kicks, 14– and 15–inch rack toms, and 18– and 20–inch floor toms. As with the rest of the kit, the bass drum could not escape the influence of the “decade of excess.” The 1980 hit and hit hard, bringing along big hair, big sounds, and bigger bass drums. 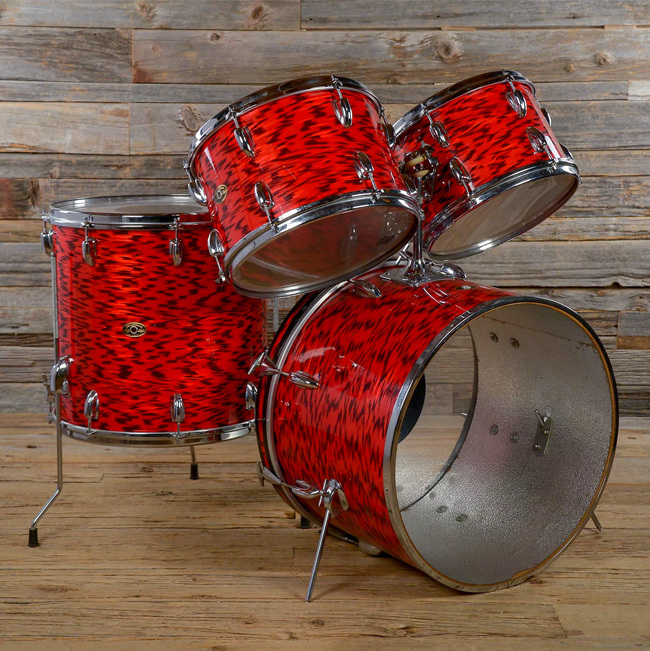 For the first time ever, mass–produced kits with deeper drums became the standard. Power toms, marching–style snares, and deep “beer can” bass drums were favored for their reduced sustain, pronounced attack, and extreme looks. 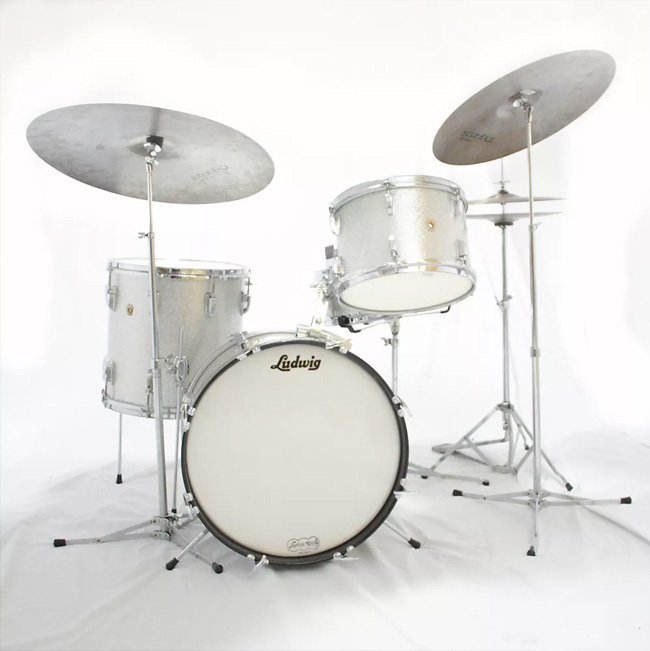 Sonor began producing 18–inch deep kicks in its Phonic Plus and Signature ranges, while Ludwig, Slingerland, and others stuck to a slightly more reasonable 16–inch. But this was still not enough for some, and French manufacturer Capelle thought they had the answer with their “Turbo” line. Anchored around insane 32–inch deep kick drums, this series featured power toms in sizes ranging from 6 to 20 inches and was also sold under license by the UK–based Orange company (yes, the amp brand). Along with Italy’s Meazzi and their HiPercussion series, Europe held down the extreme bass drum contingent for a time being, until a handful of prominent American drummers took note of this trend. Alex Van Halen — who had already been joining his traditionally sized Ludwig bass drums together end–to–end for years — finally had the company produce several extremely deep kicks for his 1988 tour kit. Similarly, Eric Carr of Kiss fame began using pairs of single–headed Ludwig kicks joined together, but would go on to use custom made single–shell deep kicks toward the end of his life. 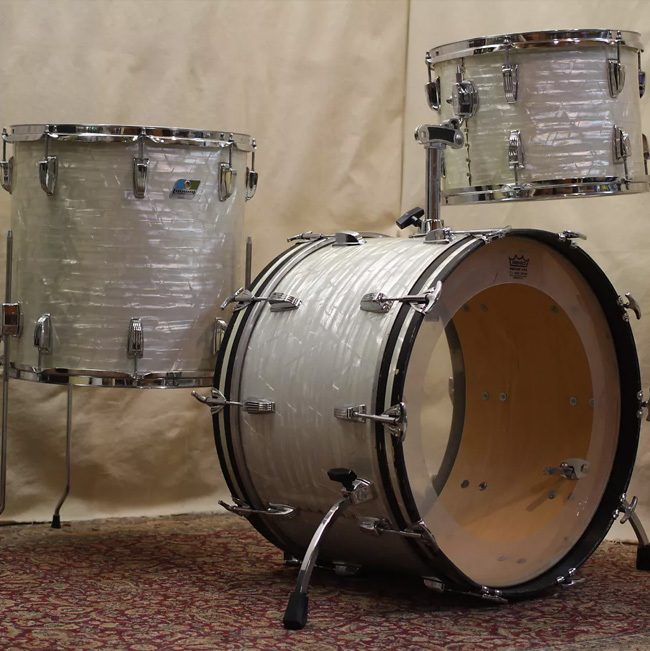 Ludwig even produced a few of these “Thunder Kick” bass drums for the public on a custom order basis, but their rarity and narrow appeal makes them extremely hard to come by today. 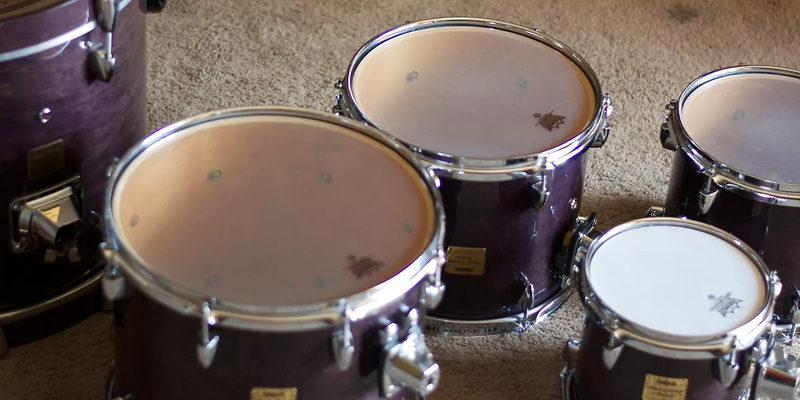 Thankfully, the bass drum’s excessive inflation was curtailed somewhat as the 21st century rolled around, and companies began offering a variety of depths to suit drummers’ varying tastes. 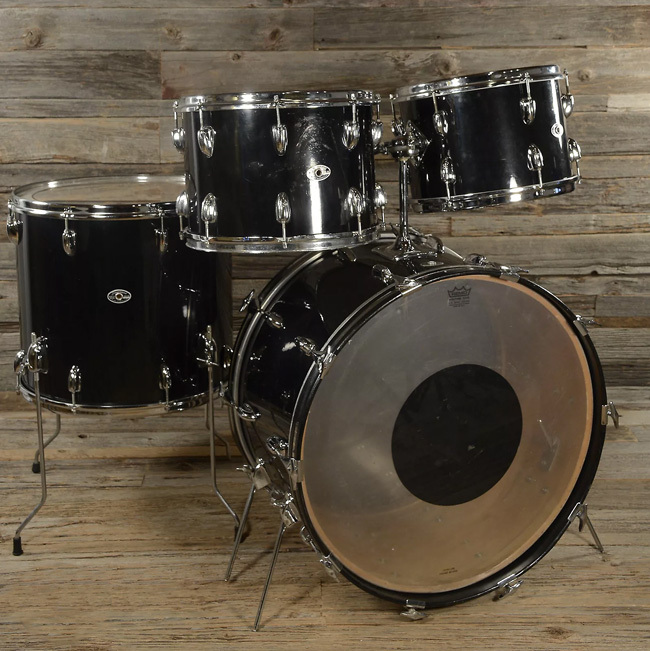 Though many “standard” kits now come with 18–inch deep drums, what’s old is new again, and kits in a range of price points — like Ludwig’s Legacy series, C&C’s Player Date, and the Gretsch Catalina Club — all offer traditional 14–inch depth bass drums for a warmer, more retro sound and aesthetic. Today, younger drummers are discovering the depth of tone possible from shallower kicks, and older players are reliving their youth with reissues based on the classic setups of players like Bonham, Buddy, Ringo, and others. Still, among metal and pop punk communities especially, the sonic and visual appeal of a deep bass drum with smaller diameters remains strong. Drums like Tama’s Starclassic and Mapex’s Saturn V (both popular with heavier drummers) feature 18– or 20–inch bass drum depths. The myriad of custom companies that popped up in the early 2000s (SJC, OCDP, Truth and others) also built thousands of kits with 18– to 22–inch deep bass drums. Once again, like today’s snare and tom options, we drummers are spoiled for choice, living in a golden age of customization and individuality. Nearly every major drum company offers kits in every series configured around a variety of bass drum sizes and shell types. From the ultra–retro styling and large, shallow kicks of sets A&F Drum Co’s Field Series and PDP’s Concept Classic, to the modern versatility and deeper drums of Tama’s Silverstar and the Gretsch Renown, there’s a kit out there for just about anyone, with a bass drum to suit. The story of the snare from military bands to crucial kit component.